When we think of the Khemer capital, the image that usually comes to mind is that of the famous temple complex at Angkor-Wat. Since it was built using stone, the temple complex survived, while other structures built using perishable materials vanished. Even though archaeologists knew that the city was quite big, it was hard to excavate due to the dense tropical vegetation which made conventional remote sensing ineffective. Thanks to a cost effective airborne laser scanning technology called lidar, which has the ability to penetrate the vegetation in tropical countries and map archaeological remains on forest floors, archaeologists were able to map the surrounding landscape recently. This technology was successfully used in Mesoamerica and applying it in Angkor has revealed a lot more about the civilization that flourished in the region. Among these, we now know that the urban spaces were formally planned and the settlement did not have a single central point. The region was divided into city blocks which followed a regular pattern with temples, settlements and ponds. It was a distributed network with many temples in the periphery forming part of the network which depended on agricultural goods. 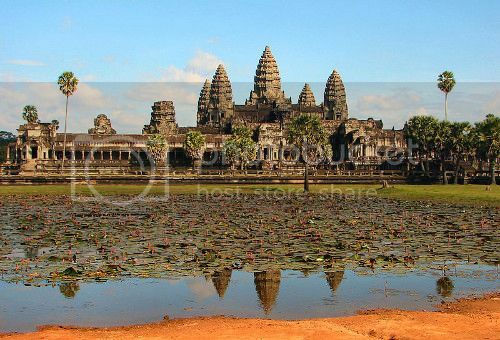 New studies have also revealed that the size of Angkor urban center was thirty five square km instead of the nine previously assumed. Also a newly mapped site, North-East of Angkor has been found to correspond to the city named Mahendraparvata, which was founded by Jayavarman II. This king, who was the founder of Angkor moved his capitals quite often. Initially it was at Indrapura, then at Hariharalaya, then at Amarendrapura and eventually at Mahendraparvata. At this place, a Brahmin named Hiranyadama consecrated him as a king, independent of Javanese overlordship. This was one of the early settlements and it had unique water management features which was seen in sites like Angkor later. From the epigraphic record, there was an idea about how the towns developed and how the urban space was related to the temples. Combined with archaeological data, there is a detailed explanation of how the town expanded. During the early period (9th century CE), life revolved around the moated temple. The area inside the temple complex itself was unstructured and the urban space around it was not demarcated in particular. Few centuries later there is evidence of urban planning with rectangular grids of canals and roads. All the occupation regions, the location and size of the ponds all followed a standard pattern. Few centuries later, as the city expanded a lot more, the standardization fell off. But still food security was provided due to the efficient water management system. Apparently, it was this water management system that eventually failed the people of Angkor. Eventually, the canals and reservoirs became dysfunctional leading to the decline of the urban centers. Coedes, G., and George Cœdès. The Making of South East Asia. University of California Press, 1966. Evans, Damian H., Roland J. Fletcher, Christophe Pottier, Jean-Baptiste Chevance, Dominique Soutif, Boun Suy Tan, Sokrithy Im, et al. “Uncovering Archaeological Landscapes at Angkor Using Lidar.” Proceedings of the National Academy of Sciences (July 11, 2013). doi:10.1073/pnas.1306539110.